Biologists have come a long way assessing ex post the invasiveness of a species. They call this Biological Traits Analysis: looking at what a species eats, how it reproduces, how it spreads, and so on. It gives them a rough idea how the species will behave when introduced in, say, the North Sea: how quick it may spread, whether it will do any damage, how much damage it will do, and so on. Even a rough estimate of these variables can help the aforementioned tradeoff between limiting access, limiting spread, and suffering/enjoying the consequences. Some biologists simulate animal behaviour assuming that the animal maximizes some objective, just like economists simulate human behaviour assuming that humans maximize their utility. Funnily, they get away with it, but apply the same principle to humans and people complain that humans “are not like that”. (Mind you, I’m not complaining, it was a biologist who pointed this out to me.) Are humans any different? One of the biologists on the project named a jellyfish after Frank Zappa. I’m in Slovenia now, attending the second annual progress meeting of VECTORS. 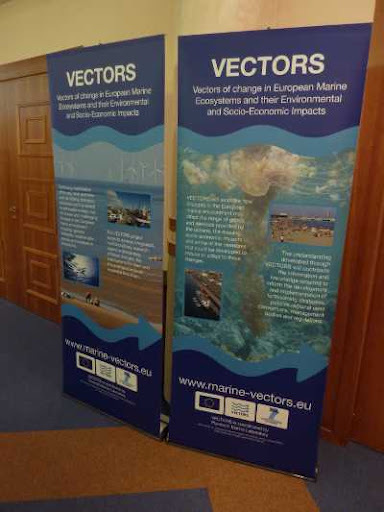 VECTORS is a huge EU-funded research project on the ecological, social, and economic consequences of invasive alien species (and other related stuff) for Europe’s seas. So while outside spring is finally taking off with a clear blue sky and a pleasant 18°C, we’re indoors talking about jellyfish and oysters. To get an idea of what VECTORS is about, consider the fact that international shipping brings us more than cheap laptops from China. As transport ships take in ballast water in the harbour of Shanghai, all kinds of critters may hitch a ride on those transport ships – Shanghaied, as it were. When this ballast water ends up in Rotterdam harbour, so do these species. From that point on, they are considered alien species as they are not native to the North Sea ecosystem. Because they are alien to the North Sea they may not survive for long. They may also find an environment with lots of food and no natural enemies. If this is so, and they become so abundant that they cause problems, we call them invasive alien species. Take, for instance, the chinese mitten crab, which may very well have travelled from Shanghai to Rotterdam on board a cargo ship. The chinese mitten crab damages fish nets and occasionally clogs up water intakes of factories and power stations. Interestingly, however, it also has benefits because it is considered a delicacy in many Asian countries. Some European fishers sell their mitten crab by-catch to Asian restaurants! Another example is the comb jelly, which was introduced from its native American shores through ballast water. The comb jelly does not sting humans, but it eats fish eggs and larvae. One study estimates that the comb jelly may cost the Black Sea anchovy fishery about $17 million per year. Shipping is not the only conduit for invasive species. The Pacific oyster was introduced deliberately by oyster farmers due to its size and growth. It is still considered a delicacy, but due to its sharp edges and its nasty habit of pointing its edges upwards it is considered a risk to swimmers and mudflat walkers. So invasive alien species can have several different effects on the economy, notably fishing, tourism, and energy. In many cases those effects are negative, as fishers, mud-flat walkers and power stations can attest. Occasionally they are positive – if you happen to like sea food. If it turns out that the negative effects of, say, the Pacific oyster outstrip its positive effects, the next question is what we should do about it. It is possible to reduce oyster abundance by fishing, as this video illustrates. You can also drag heavy chains over oyster colonies to destroy the shells. The big question is whether the costs of these interventions outweigh their benefits, where the benefits include the reduction in the costs of medical treatment and possibly an increase in tourism revenues as tourists probably prefer oyster-free coasts. You could also try to make it more difficult for a species to enter European marine waters in the first place. 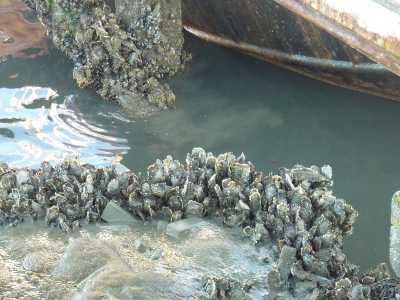 Several technologies are available to treat ballast water in ships so that invertebrate stowaways do not become invasive aliens. Again, these methods can be costly. So dealing with invasive alien species involves finding the right balance between three different sorts of costs. First, there are the costs of making it difficult for invasive species to enter your ecosystem. Second, there are the costs of reducing the species’ abundance if it has invaded your ecosystem. Third, there are the consequences of the species’ presence which could be good as well as bad. What makes this tradeoff particularly difficult is the fact that you often do not know which species may invade, nor how they will behave once they have invaded. So you need to take into account the possibility that your information changes in the future. I’d love to say that this is what I do in VECTORS – but I should give credit to Adam, who is actually doing it. Adam is one of the PhD students I co-supervise, and he develops the models to analyse the tradeoffs I have just described. Besides Adam and me, there are 70 or so other researchers involved, including other economists, marine biologists, environmental scientists, ecologists, anthropologists and so on. In about three years, we hope to give EU policy makers some concrete advise how they can best manage invasive alien species in European marine areas. So next time you cut your foot on a Pacific oyster: we’re working on it. But it may turn out that it is better to let you cut your foot than to eradicate the oyster. One of the aspects of my work I enjoy most is the interaction with other disciplines. By its very nature, natural resource economics assumes knowledge of the natural resource as well as economics. So in my career as a researcher I have worked with landscape ecologists, fisheries biologists, geologists, sociologists, and so on. Nevertheless, there always seems to be a tension in my field between, roughly speaking, economists and ecologists (where ‘ecology’ can be understood broadly enough to include any environmental science). I come across this tension on every level of my work. It is in environmental students’ reactions when I teach them the basics of environmental and resource economics. It is in the lengthy discussions (and misunderstandings) I have had with ecologist co-workers, and in the sometimes relentless complaints about ‘mainstream economics’ (whatever that may be) at ecologist conferences. It is even visible in the existence of two global professional organisations of scientists working on the economics of environmental and resource management. On the ecologist side there is the International Society for Ecological Economics (ISEE), whereas on the economist side there is the Association of Environmental and Resource Economists (AERE). For the record, I am a member of EAERE, which the European counterpart of AERE. It’s not like we are at war or something. Economists and ecologists can often work together very well, if only because both fields have a strong tradition in quantitative modelling. If you both speak the language of mathematics it is not that difficult to spot the linkages between your theories, or your models: “the amount of fish caught in my economic model fits nicely into the amount of fish that dies in your biological model.” But go to an ISEE conference, or try to explain the merits of cap-and-trade to environmental students, and you get an idea of what those poor girls in Salem must have felt like. One of the things I will do on this blog is to explain what I think are the main points of contention between ecologists and economists. What I can say in general is that these differences can be due to differences in moral values, assumptions, methodology, and, admittedly, genuine misunderstandings about each other’s discipline. I don’t think you can blame any of the two disciplines; in fact I don’t think any of the two is totally wrong or totally right. But it is interesting in its own right to look at the differences. Then, you might still wonder, why ‘Grow Fins’? My main research interest lies in the economics of marine and coastal ecosystems. The most fundamental insights in fisheries economics were already published in the 1950s, but as economic activity in coastal and marine zones is getting denser, and the range of goods and services we take from these ecosystems widens, there is still a lot of work to do for the dismal science. I intend to use this blog to highlight some of the work I am doing in this domain, which includes teaching resource economics courses to BSc and MSc students, and doing research (or supervising PhD students) on such issues as fisheries management, invasive species, and valuation. Another reason for this name is that I’m a great fan of weird fringe music such as Captain Beefheart, Italian psychedelic doom metal, Californian stoner-bluesrock, Ethiopian jazz, English Morris-on-steroids, French traditional dance music, and Flemish folk music. So expect the occasional rant about some obscure band, artist, or festival.